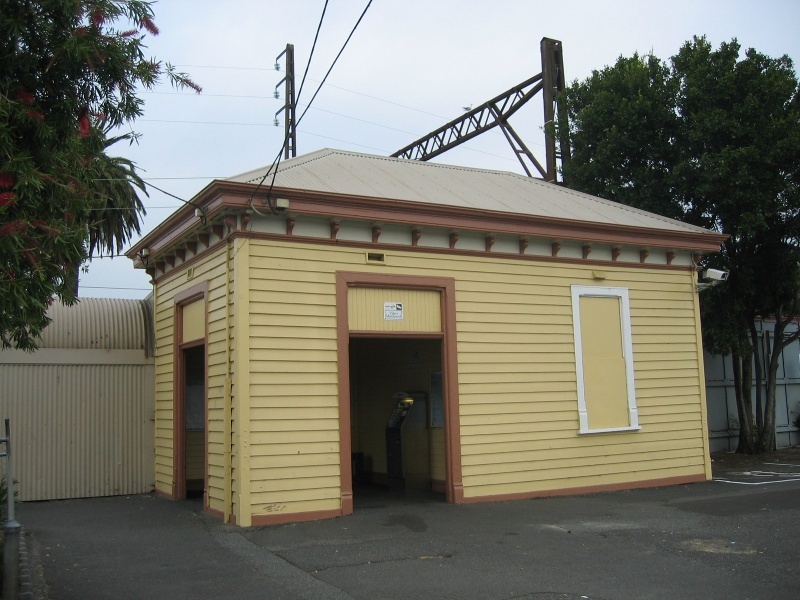 Mentone Railway Station, on the Frankston Railway Line, was known as Balcombe Road when it opened in 1881 as part of the extension from Caulfield to Mordialloc of what was then the Sandringham Line. The extant station buildings and plantings were constructed in 1913-14 after the original station buildings were destroyed by fire. 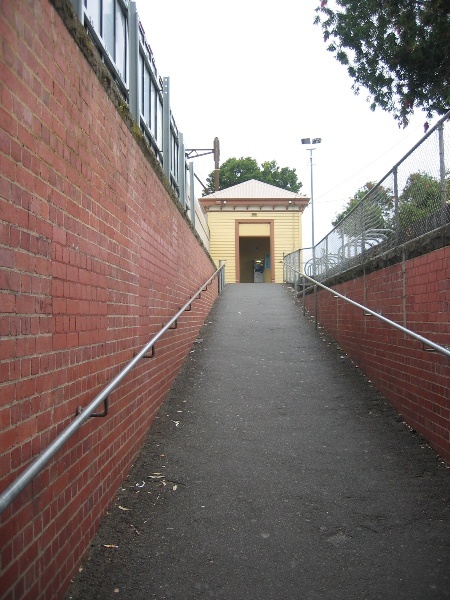 The complex consists of two bluestone and red brick platforms, a timber station building on each of the platforms, an underpass, gardens on the railway reserve on the western side of the station and the carpark on the eastern side. 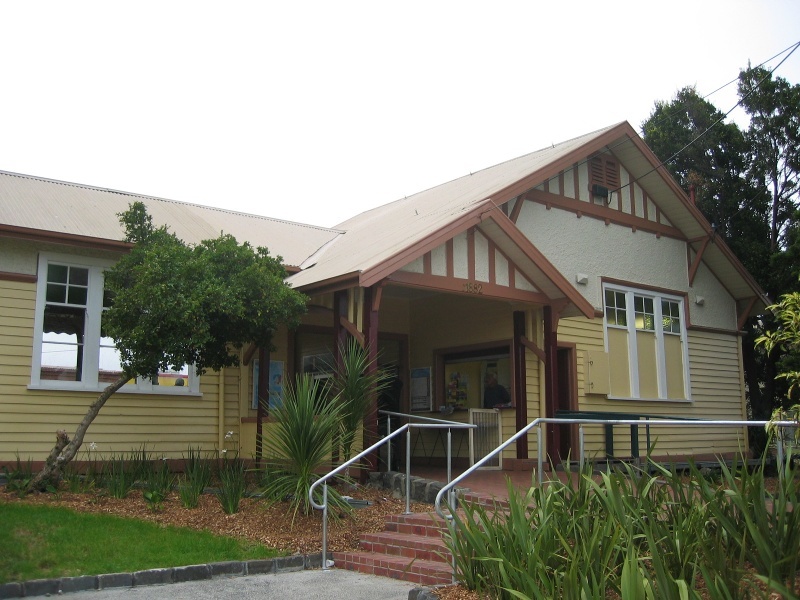 Constructed in the upgrade of extant station facilities in 1913-14, both station buildings are single storey timber structures with cantilevered platform verandahs constructed in what Ward and Connelly (1982) describe in their survey of Victorian railway architecture as the Gisborne Style. Cladding on the buildings is weatherboard, with roughcast render above door height and half timbered gables on the larger and more decorative upside platform buildings. The roofs and verandahs are corrugated iron sheet, and the verandahs are faced with a ripple iron valance. Although largely intact, some alterations have occurred. A roof has been replaced with a new hip roof, as well as the removal of a wing on the south end. The Gardens have undergone some modification but still contain a number of plantings dating to the second decade of the 1900s including three mature Canary Island Palms (Phoenix canariensis) and two Norfolk Island Pines (Araucaria heterophylla). 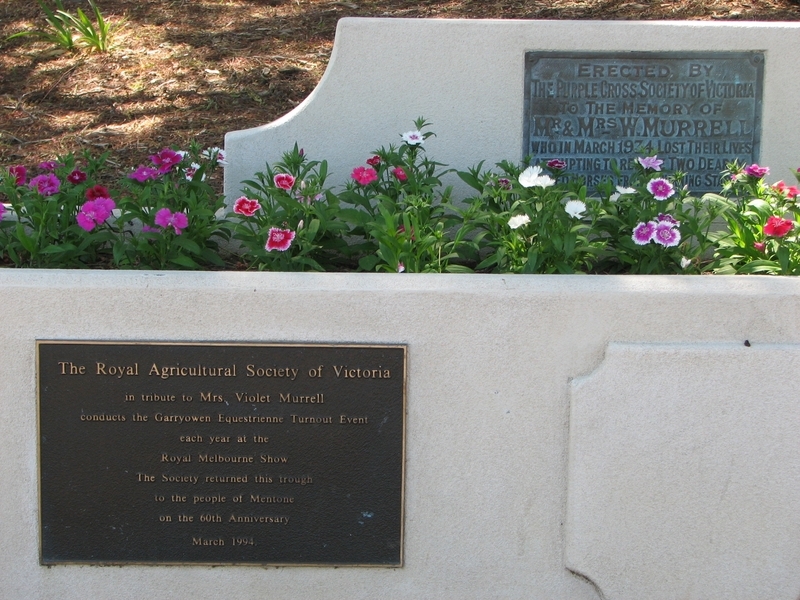 Various objects of local historical significance have been relocated to the Park including the commemorative Garryowen Horse Trough relocated from the local showgrounds in the 1990s. With Davies' Coffee Palace (1887), Mentone Station and the associated gardens are a considered component of the town plan in Sir Matthew Davies concept for a seaside 'resort' close to Melbourne at Mentone. 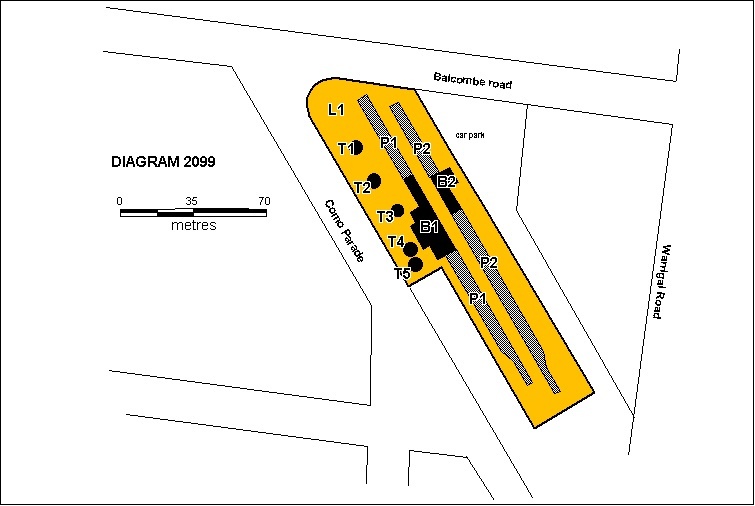 In their comprehensive State wide comparative study, Ward and Connelly (1982) consider Ripponlea Railway Station (H1588) and the Mentone Railway Station and Gardens, to be outstanding examples of an Edwardian timber railway station with an associated public garden in the railway reserve. 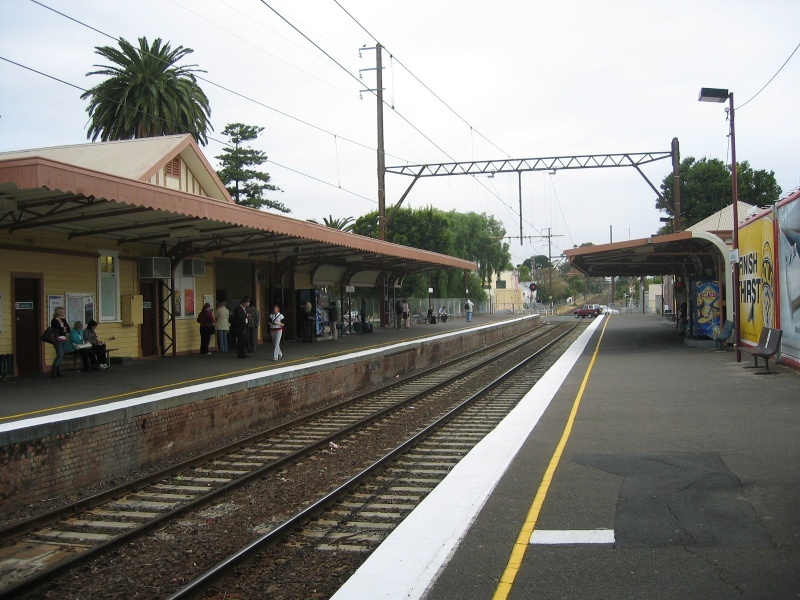 Although the station buildings and plantings date to the second decade of the 20th century, the Mentone Railway Station and Gardens is of historical significance for its association with the development of Melbourne's suburbs during the land boom of the 1880s, and in particular the notable land boom developer, Sir Matthew Davies. The arrival of the railway in 1881 was critical to the development of the resort town of Mentone, which became associated with bayside recreation and horse racing. 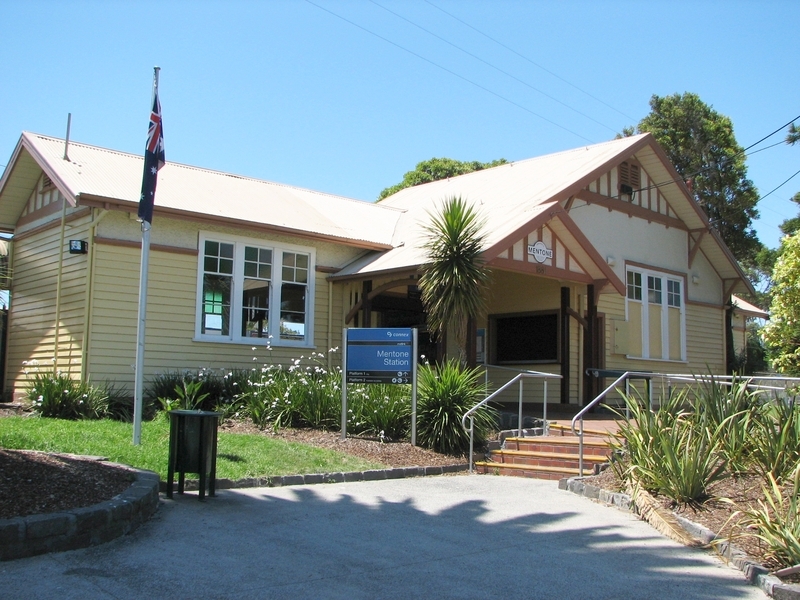 Mentone Railway Station and Gardens is of architectural significance as an intact example of an Edwardian timber complex with associated public garden in the railway reserve. 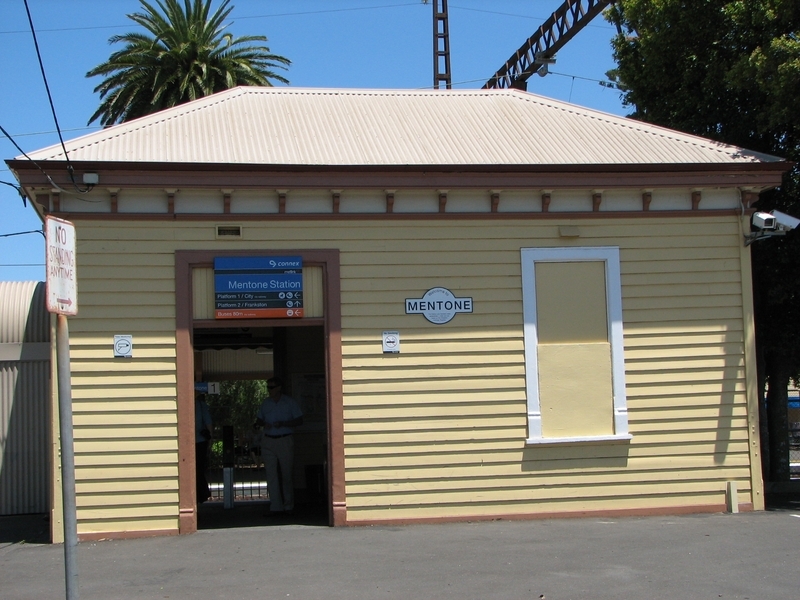 Together with Ripponlea Railway Station (H1588), Mentone Railway Station is an outstanding example of a metropolitan railway station constructed in the Gisborne Style. The Gardens are well maintained and are comparable with Footscray Station (H1563) and Ripponlea Station (H1588). 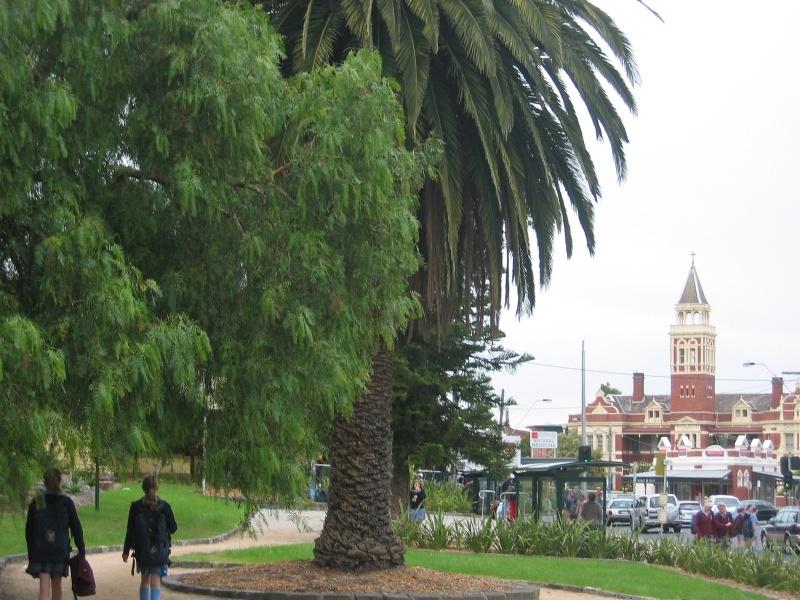 The two Norfolk Island Pines (Araucaria heterophylla) appear to be an unusual planting in Melbourne's Railway Reserves. 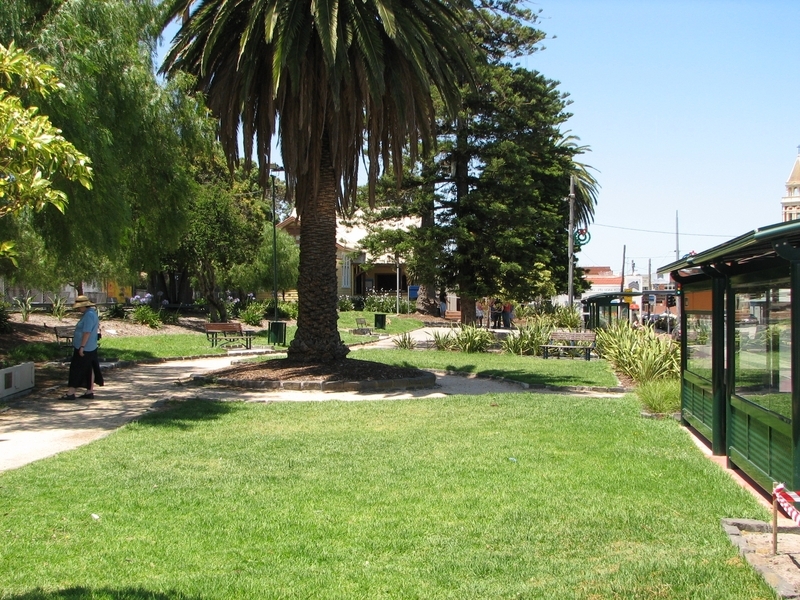 At the local level, the Mentone Railway Station Gardens are of social significance as the centre of regular local community activities and events. Mentone Railway Station and Gardens is an outstanding example of a metropolitan Edwardian timber railway station and gardens, important for its association with the development of Melbourne's suburbs in the land boom of the 1880s. General Conditions: 1. All exempted alterations are to be planned and carried out in a manner which prevents damage to the fabric of the registered place or object. General Conditions: 2. Should it become apparent during further inspection or the carrying out of works that original or previously hidden or inaccessible details of the place or object are revealed which relate to the significance of the place or object, then the exemption covering such works shall cease and Heritage Victoria shall be notified as soon as possible. Note: All archaeological places have the potential to contain significant sub-surface artefacts and other remains. In most cases it will be necessary to obtain approval from the Executive Director, Heritage Victoria before the undertaking any works that have a significant sub-surface component. General Conditions: 3. If there is a conservation policy and plan endorsed by the Executive Director, all works shall be in accordance with it. Note: The existence of a Conservation Management Plan or a Heritage Action Plan endorsed by the Executive Director, Heritage Victoria provides guidance for the management of the heritage values associated with the site. It may not be necessary to obtain a heritage permit for certain works specified in the management plan. General Conditions: 4. Nothing in this determination prevents the Executive Director from amending or rescinding all or any of the permit exemptions. General Conditions: 5. Nothing in this determination exempts owners or their agents from the responsibility to seek relevant planning or building permits from the responsible authorities where applicable. Minor Works : Note: Any Minor Works that in the opinion of the Executive Director will not adversely affect the heritage significance of the place may be exempt from the permit requirements of the Heritage Act. A person proposing to undertake minor works may submit a proposal to the Executive Director. If the Executive Director is satisfied that the proposed works will not adversely affect the heritage values of the site, the applicant may be exempted from the requirement to obtain a heritage permit. If an applicant is uncertain whether a heritage permit is required, it is recommended that the permits co-ordinator be contacted. Regular Site Maintenance : The following site maintenance works are permit exempt under section 66 of the Heritage Act 1995, a) regular site maintenance provided the works do not involve the removal or destruction of any significant above-ground features or sub-surface archaeological artefacts or deposits; b) the maintenance of an item to retain its conditions or operation without the removal of or damage to the existing fabric or the introduction of new materials; c) cleaning including the removal of surface deposits, organic growths, or graffiti by the use of low pressure water and natural detergents and mild brushing and scrubbing; d) repairs, conservation and maintenance to plaques, memorials, roads and paths, fences and gates and drainage and irrigation. e) the replacement of existing services such as cabling, plumbing, wiring and fire services that uses existing routes, conduits or voids, and does not involve damage to or the removal of significant fabric. Note: Surface patina which has developed on the fabric may be an important part of the item?s significance and if so needs to be preserved during maintenance and cleaning. Note: Any new materials used for repair must not exacerbate the decay of existing fabric due to chemical incompatibility, obscure existing fabric or limit access to existing fabric for future maintenance. Repair must maximise protection and retention of fabric and include the conservation of existing details or elements. Public Safety and Security : The following public safety and security activities are permit exempt under section 66 of the Heritage Act 1995, a) public safety and security activities provided the works do not involve the removal or destruction of any significant above-ground structures or sub-surface archaeological artefacts or deposits; b) the erection of temporary security fencing, scaffolding, hoardings or surveillance systems to prevent unauthorised access or secure public safety which will not adversely affect significant fabric of the place including archaeological features; c) development including emergency stabilisation necessary to secure safety where a site feature has been irreparably damaged or destabilised and represents a safety risk to its users or the public. Note: Urgent or emergency site works are to be undertaken by an appropriately qualified specialist such as a structural engineer, or other heritage professional. Signage and Site Interpretation : The following Signage and Site Interpretation activities are permit exempt under section 66 of the Heritage Act 1995, a) signage and site interpretation activities provided the works do not involve the removal or destruction of any significant above-ground structures; b) the erection of non-illuminated signage for the purpose of ensuring public safety or to assist in the interpretation of the heritage significance of the place or object and which will not adversely affect significant fabric including landscape or archaeological features of the place or obstruct significant views of and from heritage values or items; c) signage and site interpretation products must be located and be of a suitable size so as not to obscure or damage significant fabric of the place; d) signage and site interpretation products must be able to be later removed without causing damage to the significant fabric of the place; Note: The development of signage and site interpretation products must be consistent in the use of format, text, logos, themes and other display materials. Note: Where possible, the signage and interpretation material should be consistent with other schemes developed on similar or associated sites. It may be necessary to consult with land managers and other stakeholders concerning existing schemes and strategies for signage and site interpretation. Management and maintenance of the general living landscape, including shrubberies, borders and turf. Repairs, conservation and maintenance to structures and hard landscape elements, monuments, steps, asphalt and gravel paths and roadways, stone and concrete edging, fences, lamps and gates. Construction, installation or maintenance of services such as water, electricity, lighting, communications cabling, sewer and drainage systems. The purpose of the permit exemptions is to allow works that do not impact on the significance of the place to occur without the need for a permit. Mentone Railway Station and Gardens is important for its individual buildings and the landscape values of the associated gardens. Permits would be required for any new buildings, structures or pathways on the registered land. The exterior of the buildings is of prime importance. The interior is important if original fittings and fixtures still survive. Track works and maintenance to the buildings are able to be undertaken without a permit.